I did it. I simplified and have figured out what commitments to clear and what to keep. To be quite honest, I didn’t get rid of much, but it’s a start. I’m saying goodbye to vlogging daily and my Miss Tightwad blog. With vlogging daily I had so much fun, but didn’t consider the time commitment to editing and uplaoding vlogs each day. I did love sharing my days, though, so I might find a way to incorporate vlogging and just do multi-day recaps. But for now, that’s on hold. My Miss Tightwad blog started probably five years ago from my love for saving money and couponing. I stopped that and then turned it into a money saving/frugality blog recently. 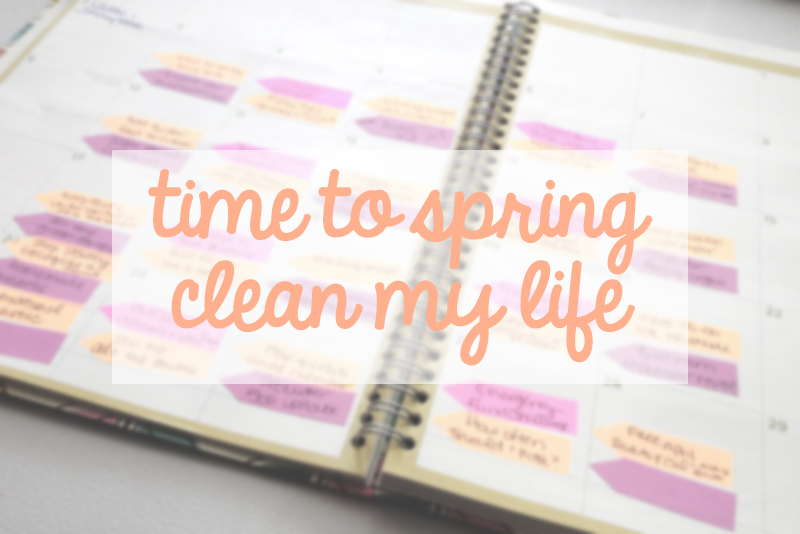 I truly believe that we spend more than we need to and that we can life a happy, comfortable life on less, but it’s just one more thing on my list of things to do each week and it’s something that I can easily share once in a while here, on my personal lifestyle blog. All of the “in the middle” things I can’t easily say NO or without a doubt say YES to. I’m keeping my Miss Entrepreneurette blog because that’s something I’m passionate about. My goals for that are to create a fun, informative and inspirational place for bloggers and entrepeneurs. I also want to eventually have it become one of my streams of income. I have so, so many ideas for that blog so that’s a keeper. Ebay and Amazon selling are here to stay. When you make your living freelancing, the paychecks are not steady in the last bit. I made more last January (2013) than I made in all of October, November and December combined. It was tough! So I’m working on creating multiple streams of income. Ebay and Amazon are two streams I’m currently working on. The rest of the items in the “in the middle” list are non-regular items that can fluctuate. My Miss Tightwad vlog I thought would be a fun thing to keep to share money saving tips once in a while without having my blog. My most popular videos there are my meal planning on a budget videos where I share what I bought and what I’m making that week. All of the Marley’s Mutts volunteering and fostering is obviously so, so important to me, but those are things that I can scale back on when needed and jump into when I have extra time. When I had my “non-neogtiable” and “in the middle” lists together I kind of put together an ideal scenario of how many hours each week I’d spend doing everything on those lists. It came out to 60 hours per week for the things that need regular attention such as blogging, design work, my part time job, etc. That’s still entirely too much, but it’s a start and if I can work efficiently I think I can bring that number down. Having that number is a big wake up call so I’m going to continue working on taking my own advice and simplifying my life even more.